Hellman & Friedman LLC's Capital Partners IV Fund has generated a 36 percent return for investors since 2000. Kohlberg Kravis Roberts & Co.'s Millennium Fund has done even better, notching a 41 percent take since 2002. Investors in private equity funds who've enjoyed large returns like these during the buyout boom should brace themselves for a fall. All falls happen in the Fall. 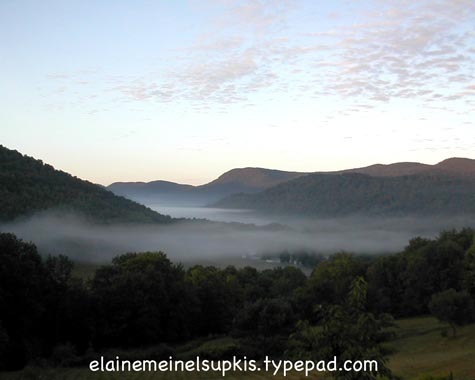 And Fall is around the corner here on my mountain, a few trees are experimenting with changing their leaves to red, this morning, as the photo above shows, there was a heavy fog in the valley and high, thin clouds: typical early Fall weather. As I was out in the fields yesterday, a small hummingbird circled my head and flew off, one of the the last ones passing through from Canada, heading south. The expensive bandaids put upon the gaping wounds of our economy have not stopped the flow of red ink, indeed, as I predicted, it increased this flow so of course, the patient continues to die. I expect more blood transfusions but they will only cause the gushing blood to increase since the basic injury is still wide open. The problems besetting the American empire are bloody, indeed. More and more soldiers die in both Afghanistan and Iraq, a daily parade of corpses. The heroin trade is out of control, the oil is still below the levels under UN controls of Saddam. The fires rage higher in not only Iraq and Afghanistan, India is hit again by terrorist bombings, too. Pakistan is undergoing a full revolution out of CIA controls, Turkey is turning Islamist as the Palestinians continue their Battle of the Warsaw Ghetto with the Israeli Jews playing 'Let's be a Nazi'. And Greece as well as parts of the US continue to burn. As I will prove yet again via today's astonishing news. Lehman Brothers Holdings Inc., Bear Stearns Cos. and Citigroup Inc. were downgraded to ``neutral'' from ``buy'' by Merrill Lynch & Co. analyst Guy Moszkowski, because of probable losses on mortgage bonds and leveraged loans, as well as a slowdown in investment banking. New York-based Lehman and Bear Stearns, the fourth- and fifth-biggest U.S. securities firms, will be hurt because of their dependence on debt markets, and Citigroup may be pinched by loans and leveraged-finance commitments, Moszkowski wrote in a note to investors today. He cut his profit estimates for all three companies, as well as for JPMorgan Chase & Co. All four stocks fell. Oh my god. This is the end of any pretense of a bull market. As I predicted, no one sane would want to give 5¢ to a bunch of pirates who rush off to the Cayman Islands or other Queen of England pirate coves to hide their ill-gotten gains! Lehman and Citibank: next, I guess it is time to poke around their SEC files to see where the blood is flowing, eh? Financial stocks have posted the biggest drop among 10 industry groups in the S&P 500 this year amid concern that higher borrowing costs sparked by subprime mortgage defaults will erode earnings from trading and debt underwriting. Home values declined 3.2 percent in the three months ended June from the same period a year ago as sales dropped and lenders made it harder to get a home loan, according to a report today from S&P/Case-Shiller. The rise in new home sales last month was a phantom. Many a person, lured by the goodies offered by the developers anxious to dump properties no matter what, signed contracts. I know these instruments. In them, there is a proviso the buyer won't lose their downpayment if no bank will give a mortgage within certain defined limits. Now, these new buyers have to arrange loans and possibly, sell their own homes! The number that will succeed and get into the houses is probably going to be less than the numbers suggest. Last month, people still believed the housing bubble didn't exist and it didn't really pop and it was at a bottom anyway, look at the bargains! But since that day, I would suggest the majority of these contracts were written before July 17, 2007, banks have basically ceased giving out mortgages. The money cycle that runs through Asia and back into our banks still is there in the form of Japanese 'carry trade' but the Chinese Yanzte river of gold has vanished. I would suggest, entirely. True, they just handed over $200 billion for investments BUT not for property loans! We just learned this week, they lost over $11 billion, funding US housing fun and games. NO MORE. This is done. I think, forever. The realization something is wrong is only just beginning to dawn. When it is fully understood, today's panic will look like confidence. The worst of the credit-market debacle may be over and stocks will likely rise as the global economy expands, said Mark Mobius, who oversees $30 billion at Templeton Asset Management Ltd. in Singapore. The fund manager said his company has used the market rout in the past month to add to stocks that are attractively priced, including energy producers in Asia and Brazil. South African shares and those in Chinese companies traded in Hong Kong are among the most attractive in emerging markets worldwide, he said. Since Mobius has written this just yesterday and is now proven totally wrong, we should strip this Mobius naked and have him parade with the naked Emperor, Bush. I wouldn't give this foolish young man my money! And do note, he is buying Brazil! Yesterday, I examined the Dreyfus Fund's activities in order to show how the decline started in early 2006. Everyone is going to Rio! The returns there are better than here. Rio seems to be heading south for the winter with a vengence. I heard more than one hedge fund or equity fund talk about how they were not exposed to any dangers because they already had abandoned the US and were going to march in the Rio Madi Gras stark naked, laughing drunkenly. Well, the snow is blowing there, too! When empires collapse, everything falls with them. The one thing I am certain about is, China will endure this collapse. Proof: they just rescued some of those poor miners trapped in China's hell-hole coal mines. These men stayed alive drinking their own urine and chewing on coal! The Chinese are very stoical! They are also very big and have lots of natural resouces so they won't collapse like the militarily-over-extended Russian Empire when it collapsed. Mobius's bullishness on stocks is shared by some of the biggest banks. Credit Suisse Group recommended on Aug. 21 that investors should raise holdings of stocks worldwide following the sell-off in the past month and on speculation the Fed won't let a credit-market debacle hurt growth. Hope springs ever eternal. But the Credit Suisse Group is in trouble with the Chinese for selling them trashy tranches. And so this 'Buy, buy, buy' call was totally funded by the Bank of Europe and the Federal Reserve pumping half a trillion dollars into the money stream in just two weeks! And now it is over. In just 2 hours, stocks here in NY fell 123 pts in the DOW. The Fed will have to interrupt their happy little picnic and pick up the Plunge Protection Team and parachute them with another half a trillion dollars we don't have, down to Wall Street. This is supposed to be the quietest week in stocks, you know. Labor day, around the corner, the kids going to school, vacations winding down. The ONLY time stocks are busy this week of the year is when there is a great crash gathering steam. And all the brokers know this. They aren't dumb. They say things to keep the business going but in private, they know better. I no longer hang out at the Wall Street drinking joints but you can bet, they are doing big business right now. This is where the real information is passed hand to hand, in whispers. The yen advanced for a second day against the dollar and euro on speculation banks will report more credit-market losses, prompting traders to reduce higher-yielding investments funded by loans in Japan. The yen gained against all 16 major currencies tracked by Bloomberg as investors pared the so-called carry trade. DBS Group Holdings Ltd. said it has more at risk from asset-backed debt than it earlier reported, while the Times in London said State Street Corp. had $22 billion of exposure to asset-backed commercial paper. Deutsche Bank lost $22 billion? This is double the Chinese! The Germans used to be scared of stupid banking thanks to the terrors of the Weimar collapse coupled with the Great Depression and Hitler's rise! But the last of the oldest investors/bankers/former Nazis died. I knew some of them, years ago. They considered my dad to be a god because he saved them from being put on trial. And pulled more than one out of Eastern Germany right before the Soviets rolled in. They all became quite sober realists after WWII. A hard lesson, indeed. But the new people running things fell for all the goofy schemes from the Wild West US. Will Germany lend us more billions? Are we nuts? We were irresponsible and still are. Are we raising taxes, cutting our military spending by 60% and pulling out of our imperial bases abroad? Are we protecting our industrial base? Can we ever pay any of our bills? NEW YORK (Dow Jones)--The yen is regaining some of its losses from last week against the dollar and euro Tuesday, as currency markets continue to trade in narrow ranges. TOKYO (Nikkei)--Tokyo has the third most expensive mobile phone communication fees among seven major global cities after London and Paris, according to a survey released Tuesday by the Ministry of Communications. U.S. consumers are defaulting on credit-card payments at a significantly higher rate than last year, according to a Financial Times report citing Moody's data. Credit-card companies were forced to write off 4.58% of payments as uncollectable in the first half of 2007, almost 30% higher year-on-year, the report said. But Moody's said the rate of losses remained well below the 6.29% average seen in 2004, a year before the US enacted a new law that made filing for personal bankruptcy more onerous, the report said. In 2004, people were going bankrupt at the bottom rungs. Now, it is nearly impossible to go bankrupt but they are still going bankrupt. The financial wizards passed many millions of dollars across the palms of our utterly corrupt Congress, HELLO, HILLARY CLINTON...and still are paying zillions to..HELLO, HILLARY CLINTON...to do this dirty deed and now they hope to protect them from the collapse of the masses who will be like a landslide of stones which can't produce any blood no matter how hard Hillary Clinton and her fellow corrupt Senators who voted for that stupid law, mash the voters. By the way, Kucinich was against this law and was very ardent about it as well as against the war. Vote for him, please. U.S. home prices fell at a faster rate in the second quarter, down 3.2% compared with the same period in 2006, Standard & Poor's reported Tuesday. It marked the largest year-over-year decline ever recorded in the 20-year history of the Case-Shiller home price index. OUCH. This is going to hurt, big time. Just three months ago, a bunch of clowns were claiming that real estate is all local so there can't be housing bubbles across the nation. But alas, this is false. Even if not all parts take part in a bubble, ALL GO DOWN WITH THE SAME SHIP WHEN A BUBBLE POPS ELSEWHERE! This logic escapes small minds. But the history of real estate speculation and cheap money illustrates this lesson over and over again just like the idea that fiat paper is a continuous temptation to go to infinity. In view of what was about to happen, it is enlightening to recall how things looked at this juncture to the financial prophets, those gentlemen whose wizardly reputations were based upon their supposed ability to examine a set of graphs brought to them by a statistician and discover, from the relation of curve to curve and index to index, whether things were going to get better or worse. Their opinions differed, of course; there never has been a moment when the best financial opinion was unanimous. In examining these opinions, and the outgivings of eminent bankers, it must furthermore be acknowledged that a bullish statement cannot always be taken at its face value: few men like to assume the responsibility of spreading alarm by making dire predictions, nor is a banker with unsold securities on his hands likely to say anything which will make it more difficult to dispose of them, unquiet as his private mind may be. Finally, one must admit that prophecy is at best the most hazardous of occupations. Nevertheless, the general state of financial opinion in October, 1929, makes an instructive contrast with that in February and March, 1928, when, as we have seen, the skies had not appeared any too bright. As I wrote this, stocks fell another jolt, minus 155 pts. off topic....Nice shot of your "back yard". Why here’s a second non-fatal collapse 3 weeks later. Word from a relative in Ft. McMurray is that the Chinese were in fact working to their standards not ours. It seems it’s prudent for them to save time and money by spot/tack welding structural elements where continuous bead is called for. North American workers can breathe a sigh of relief, imported foreign nationals working on mega projects which potentially mixed with NAFTA provisions and corporate fiscal governance could have become widespread, have been nipped in the bud. All the Chinese workers are gone and their work has been taken up by Canadian firms. Quick question: Why does your friend think BoA is not insured? Aren't all regular bank checking/savings accts and CDs insured by FDIC? I will check Bank of Americ out again. Yes, welding: an art form that in Asia, isn't as strict as here but then, everyone is cutting corners, aren't they? OK, will write a bigger story about Bank of America. their CD are not FDIC but their smaller, more meaningless accounts that pay virtually no interest are FDIC. This is how most banks operate. You have to trust them if you buy the $10,000+ CDs. Not to my knowledge around here. Pressure vessels, compressors, pumps, pipelines, steam injection, valves, processes. You name it, in abundance. Failed systems, spills, extremely rare considering the amount of equipment in place. I'm glad to hear that. Out here in the US, it is a constant worry since everyone wants things to look good but aren't concerned about the inside stuff. Which is why Mattel didn't bother to test their own damn toys they imported into America. "BERNANKE WILL DROP INTEREST RATES TO 4%"
The Fed lowering the Fed Funds rate is likely because there are so few counter gambits left. The dollar will go much lower and will accelerate the boycott on U.S. backed debt securities. But, it buys time - maybe. Sub prime mortgages as catalyst for all this sorrow is too convenient. It’s a red herring in my opinion. The media jumped all over the notion that undeserving people were greedy and lied in order to qualify for a mortgage. Think about it. This brings down a powerful economy? Think instead about derivatives with a notional value seven times as large as the world economy. When the Fed opened the door for emergency repos they took everything as collateral: sub prime mortgages, prime mortgages, and RV and boat loans. All financial assets are in trouble now. This dates back much before the Greenspan inspired Housing Bubble. The panic over the so-called debt crisis is really a panic over undistributed inventory. The banks, broker-dealers and funds still have lots to sell to targeted bag holders. But, the bag holders got a "heads-up" this time. So, special terms are being cut to make it attractive again. The uninitiated better watch themselves and not assume they're buying a bottom. The financial players forgot about time. The arrogance of their position assumed they control the game clock too. Gann’s study of the relationship between time and price demonstrated that "when time and price coincide, change is imminent". The Fed and Wall Street are up against powerful forces that want to turn the markets down now. You are correct, Cato. Note that I never claimed mere homeowners are responsible for this mess. I have pointed out frequently that the sums sucked into the vortex in the form of take overs and buy outs dwarf our entire GNP. Elaine, I agree you have been fair about the whole mortgage debacle and who has responsibility. Yes, sub prime home borrowers have to accept responsibility too. How are the terms of their mortgages much different than the high rate and penalty requirements imposed by credit card companies? What difference is there between a sub prime borrower and a prime mortgage borrower who also over reached, bought too much house and whose family is unexpectedly down one income? What is most interesting is the spotlight remains trained on sub prime paper when, in fact, the Fed is taking prime mortgages just as fast as the banks can jettison them. This problem is not at all isolated to sub prime. It’s the designated scapegoat. Consider Sears 2nd quarter profits: down 40% due to declining sales. Bloomberg News talks about Sears’ plan to do interesting things with refrigerators and ovens that will turn it all around and restore them to glory. Naturally, Credit Suisse rates them “outperform”. Before the day is out the media will attribute all of Sears’ woes to sub prime mortgages. "Turkey is turning Islamist as the Palestinians continue their Battle of the Warsaw Ghetto with the Israeli Jews playing 'Let's be a Nazi'..."
Elaine, your turn of phrase and selection of images bite like a lash but like a lash does tend to gather one's focus on what's occurring. Do carry on and don't cut them any slack. Someone has to stand against the tide of misinformation and propaganda that's out there. In today's world every single voice that is raised against it is important. With your writing skills it is doubly important that you continue to speak out.